The “Move Longterm Reports To Disk” command (REPMVTODSK) allows you to move reports from long-term to short-term storage. It restores reports stored in long-term storage, on tape, or an optical device, to a short-term status on disk. For example, you can use the REPMVTODSK command to change the medium or device where long-term reports are archived. First, move reports archived for long-term storage on an optical drive to short-term disk storage. Then, archive them to long-term storage on a different medium or device. You can use the REPMVTODSK command to move reports from long-term storage to short-term disk storage only. Examine your archive strategy and schedule carefully if you are using the REPMVTODSK command to remove your reports from long-term storage. You want to avoid the issue of moving your reports to short-term storage and then accidentally returning them to long-term status when you perform your next archive, which may be set up to run automatically (see the next bullet item). While you are running the REPMVTODSK command, do not execute the REPARCHIVE command and specify long-term storage—REPARCHIVE STAGE(LONGTERM). Reports with a Restored status and reports that were archived using Robot Save and an Automated Media Librarian (AML) require special processing (see Special Cases below). The REPMVTODSK command uses RBTSLEEPER, a multi-threaded job queue, as its default queue for processing. Because the jobs the REPMVTODSK command starts use the same device to restore reports, only one of these jobs can be active at a time. To submit multiple volumes for processing, you must specify a single-threaded job queue (see Specifying a Single-Threaded Job Queue). If the volume of reports you want to move to short-term storage is so large that transferring them from tape one by one is too time-consuming, you can use the REPMVTODSK *LIB option to specify a temporary library to use for the transfer instead of tape. To use this option, you must have enough disk space (DASD) available on your system to hold the reports in a library (see Restoring Reports by Using the *LIB Option). Enter REPMVTODSK at a command prompt and press F4 to display the Move Longterm Reports to Disk (REPMVTODSK) command prompt panel. Specify OPTICAL or TAPE for the device code to process the reports and press Enter. If you specified OPTICAL, the Optical Volume Group Name parameter displays. Enter the HFS Volume group name you use for long-term archiving and press Enter. If you specified TAPE, the Tape Device Name parameter displays. Enter the name of the tape device you use for long-term archiving and press Enter. The *LIB option was added in Robot Reports R07M38. You can use this option to specify a temporary library to use for restoration if you have enough DASD available on your System i (see Restoring Reports by Using the *LIB Option). 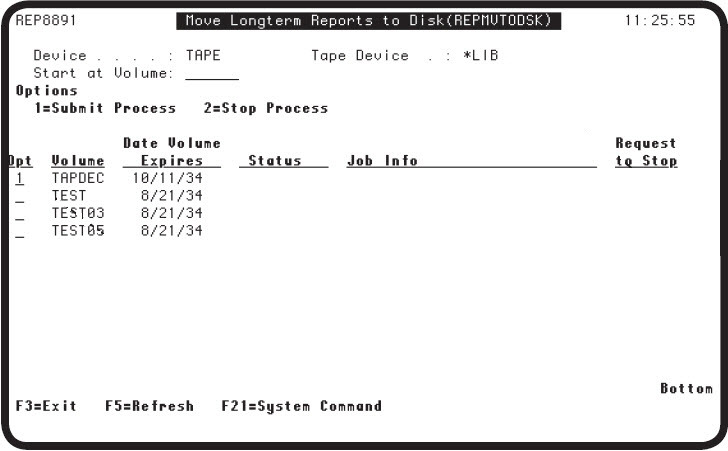 The Move Longterm Reports to Disk (REPMVTODSK) panel displays. Enter the option you want to use next to the volume and press Enter. Note: The REPMVTODSK command uses RBTSLEEPER, a multi-threaded job queue, as its default job queue for volume processing. Because the jobs the REPMVTODSK command starts use the same device to restore reports, only one of these jobs can be active at a time. If you plan to process multiple volumes, you must specify a single-threaded job queue. For more information, see Specifying a Single-Threaded Job Queue below. Use option 1, Submit Process, to submit a volume-processing job. Use option 2, Stop Process, to end a volume-processing job. If the job you are ending is active, it ends in a controlled manner. If it is not currently active (for example, it’s in the job queue), it ends immediately. In Robot Reports R07M38, the *LIB option was added to the REPMVTODSK command to allow you to specify a library in place of a tape device. You can use this option to speed up the process of moving reports to short-term storage if you have a large volume of reports to move and enough disk space (DASD) available on your IBM i. This process only works for reports archived after you converted to Robot Reports 7. You can still use the REPMVTODSK command directly from tape for reports archived on all versions of Robot Reports. If you do not want your job to run through the RBTSLEEPER job queue, see Specifying a Single-Threaded Job Queue below. You must ensure that you have enough DASD available on your system and you must monitor your DASD level closely during the *LIB process. 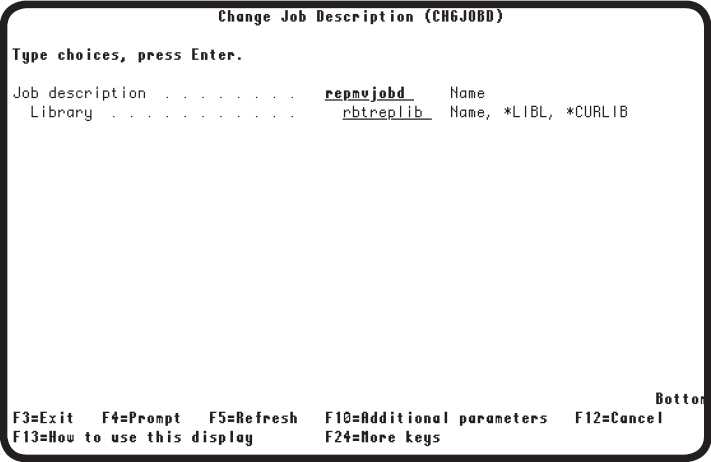 If you restore a library to your IBM i and you do not have enough DASD available, you could bring your IBM i down. Restore one or more sequences from a LONGTERM tape to the library using the following command. You can perform this step multiple times if you have enough DASD. where: tapxx is your tape drive and n is the sequence number from the tape. When the Move Longterm Reports to Disk (REPMVTODSK) panel displays, select the tape volume id for the tapes you restored in step 2. Select and process all of the volumes you restored in step 2 using the RSTLIB command. The tape device (*LIB) is actually the RBTREPRST library. Enter a 1 next to each volume you restored in step 2. When your job completes, the only items remaining in the RBTREPRST library will be expired reports that you cannot use on your system. You can clear or delete the RBTREPRST library. 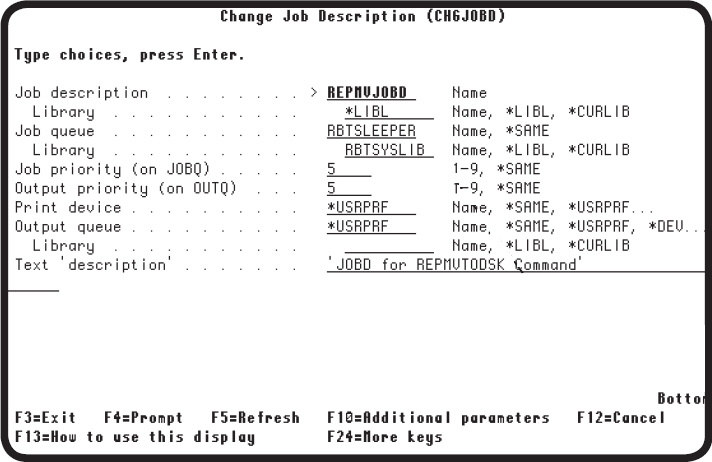 From the Change Job Description (CHGJOBD) panel enter REPMVJOBD in the Job description field and press Enter. In the Job queue field, replace RBTSLEEPER with the name of a single-threaded job queue and press Enter. Replace RBTSLEEPER with the name of the single-threaded job queue. This section describes reports that have special requirements to use the REPMVTODSK command. To process all reports, specify zero (0) for the Days Old to Purge parameter and press Enter. Important: The REPRMVRST command processes all reports that have a status of Restored and returns them to their previous status. If there are reports with a status of Restored that you do not want changed to their previous status, you must manually remove them using the Robot Reports Report Archive History panel before you execute the REPRMVRST command. When the REPRMVRST command has finished, rerun the REPMVTODSK command to move these volumes to short-term storage. Change your Robot Reports archive options to not use Robot Save for archiving. To do this, select option 1, System Defaults, from the Robot Reports System Setup menu. Specify N (no) for Use Robot Save for Archive on the System Defaults panel. Place the AML in manual mode. Be sure the tape device name you specify on the REPMVTODSK command TAPDEVICE parameter is the name of the tape device and not the name of the AML. Be sure to reset the AML’s mode and return the Robot Reports archive options to their previous settings before you run your next long-term archival process.